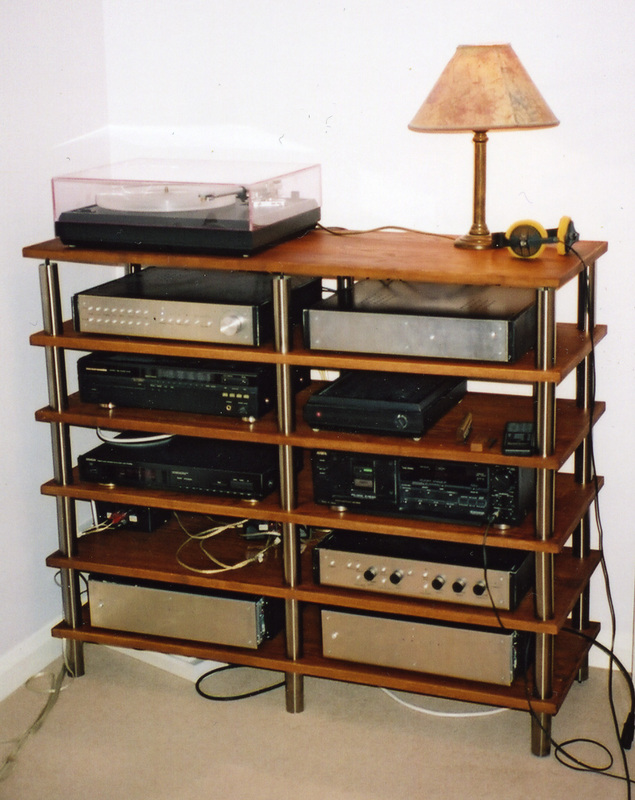 For many years I used a Sound Factory Tripod frame for my system, which was built up out of a set of rigid steel frames, linked into a stack by vicious spikes, and onto each of which a simple black-painted MDF shelf was placed. This provided a solid and decent-looking (if gloomily black) foundation for my electronics, though the central position of the third leg at the rear made for tricky access, particularly for XLR connectors. Three of four years ago this was augmented by a wall-mounted Wallnut shelf for my turntable and its power supply. However, once I took my first tentative steps into the world of active speakers, with an extra box for the active crossover as well as a second power amplifier, I ran out of space. I ended up with the two amplifiers sitting on the carpet under my turntable shelf, one on top of the other. Obviously not a long-term solution, and certainly not an arrangement I'd recommend. Finally, when I moved into a new modern house, I found myself short of a suitably sturdy wall to attach my turntable shelf to; I couldn't bring myself to entrust two grand's worth of precision mechanical engineering to a centimetre of plasterboard. My frustration at not being able to play my beloved LPs, combined with the shortage of funds that inevitably accompanies moving into a new home, set me wondering whether I could build an attractive support system for my whole system, and allow for any possible expansion. I was inspired from two directions. Firstly the TNT Flexy system, an ingenous but very low-cost project, gave me the idea of using threaded rods as the vertical supports. This has the big advantage of allowing the shelf spacing to be infinitely adjustable, so that each shelf can be levelled individually. 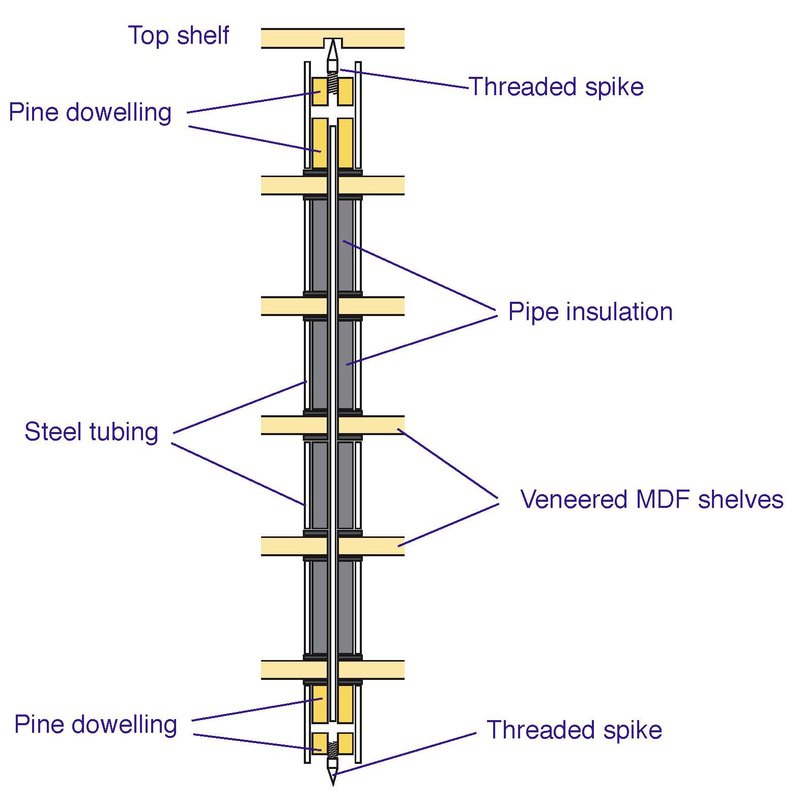 However, I wasn't convinced that the threaded rods were best employed in compression, as they are in the Flexy, since this arrangement relies on the bending stiffness of the rods to prevent it collapsing under load like a puppet in free-fall. Although there are some lovingly crafted realisations of the Flexy design out there (for instance here and here), I also felt that I could do better aesthetically than those exposed threads (though at least one version of the Flexy hides the threads inside plastic tubing, but the big nuts and washers are still on show)). One ingenious builder has built a Flexy inside an existing cabinet, which looks very attractive. I then saw some shelving in the local branch of Bo Concept (a Danish furniture chain) which I liked the look of. In this hardwood shelves are supported by tubular stainless steel uprights at each corner, and its clean lines and harmonious combination of the contrasting materials of steel and wood appealed to me. It struck me that I could use the rods in tension to hold sections of steel tubing between shelves, so combining the modern good looks of the Bo Concept shelving with the modular structure of the Flexy, while improving on the mechanical stability of the latter. The shelves are 18mm ash-veneered MDF sheets, 40 cm by 114 cm, and with 6mm solid ash edging fixed all the way round with PVA glue to hide the unveneered MDF. I stained the shelves with cherry water-based dye from W. S. Jenkins to match my speakers (though of course the grain of the two woods looks very different), then finished with four coats of Tung oil, the first diluted 1:1 with white spirit for better penetration. I finished off the upper surfaces with three lots of wax. The uprights are 35mm stainless steel tubing, cut into 15cm lengths, and these simply sit between the shelves. The interior of each tube is filled with handily-proportioned foam pipe insulation to cut down any ringing, and there is a rubber washer at each end for more damping and to equalise stresses on the shelves. Running the whole length through the middle of each leg is an 8mm threaded rod, which engages in T-nuts in the top and bottom pipe sections, and these hold the whole thing together between them. There is an 8mm threaded spike embedded in 35mm pine dowelling via threaded inserts from Wilmslow Audio at both ends of each leg: the lower one facing down to give good stability on the carpeted floor, and the one at the top facing up to support the top shelf. The next-to-top shelf is secured to the studding in the back wall at two places with steel brackets to make sure the whole thing doesn't rock. After working on these shelves on and off for more than six months I am very gratified by how they turned out once I'd assembled them. The finish exceeded my expectations, and to my eyes the whole thing looks very fine in our newly-decorated living room. My turntable (Pink Triangle PT TOO) is in my experience unusually sensitive to the stability of its support, and any instability shows up as a pitch wobble. However, on these shelves it sounds even more solid and transparent than when it lived on the Wallnut shelf at the old house.